For the wine enthusiast, we’ve pulled together some of our favorite accessories that are the perfect size to stuff in a stocking. Wine Sippy Cup or Unbreakable Stemless Wine Glasses, for when you’re on the go. Wine Bell, for when you need to be topped off, but you’re too comfortable to move. Wine Pearls to help keep your white wine crisp during the hot summer months. An elegant stainless steal wine stopper and pourer, which has function and fashion combined. Wine Aging Tool – When dipped into your wine the patented metal alloy on the tip replicates the aging process, softening the tannins in young wines and improving their taste. Red Wine Stain Remover – because anyone who enjoys red wine needs this. Wine Aerator – This elegantly fluted glass spout attaches to any bottle to aerate the wine as you pour. The holidays aren’t the holidays without an endless supply of chocolate treats. And no one does chocolate better than Godiva. So, throw some truffles in everyone’s stocking – Milk Chocolate, Dark Chocolate or Mint Flavor are our favorite. We also love Godiva’s chocolate bars. The dark chocolate with raspberry filling bar is worth breaking the diet for. We also really love this Chocolate Christmas Coal and Chocolate Heels as fun and delicious stocking stuffers. Make sure your loved ones are warm this winter with a great pair of cashmere gloves. The perfect winter accessory. We’ve pulled a list of our favorite (and affordable) cashmere items: Cashmere Scarf, Cashmere Infinity Scarf, Cashmere Gloves, Cashmere Fingerless Gloves, . If you’re interested in designer cashmere for the winter season, we love pairing our favotire winter ensamble with a classic Burberry cashmere scarf. Our favotires are the Mega Check in Blue or Red. Definitely on the high-end for a stocking stuffer, but will definitely make an impression and keep your loved one warm and stylish all winter season. A unique and fun phone case is a great stocking stuffer. Especially if the recipient is getting a phone as a bigger holiday gift. Consider phone cases that are fun and match the personality of the person you’re stuffing a stocking for. Kate Spade has an iPhone folio that we love. It’s slim, includes a card slot and even a built-in mirror. For the frequent selfie taker, consider a iPhone Case with Built-In Bluetooth Selfie Stick (yes, it exists – this is also a worthy white elephant gift). We also love Kate Spade’s Scallop Leather Stick-on Smartphone Case Pocket. It’s just big enough for a couple of cards and a bit of cash and also fits multiple smartphone models. The dry winter air can wreak havoc on skin. So, small sized moisturizers and lip balms are always great stocking stuffer. Another great gift is mini beauty products that can fit easily in a work tote or travel bag for on the road. Stop by a Sephora, Ulta Beauty or even a Victoria’s Secret and take a look at their mini-size products by the check out lanes. They will have an abundance of great products! Consider getting small sizes of some of their favorite products or ask the ladies at the front for best sellers or must-try new products. Any of these are sure to make great stocking stuffers. The winter and holiday season is the perfect time for warm, comfy socks and slippers. 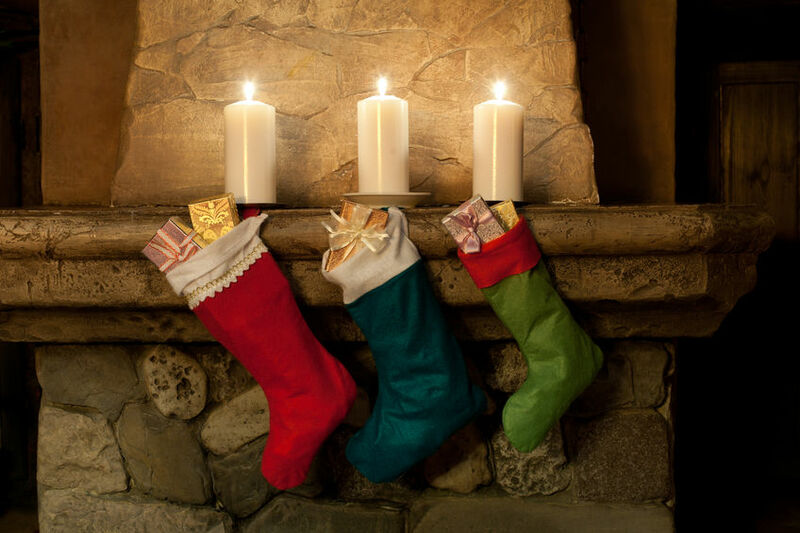 So, stuff stockings with some fun and warm socks or slippers. A few of our favorite styles: Critter Slippers, UGG Cozy Slipper Socks,Kate Spade Owl Slippers, Chalet Socks (also available in bright red or blue for the holiday season), and Penguin Slippers. They’re just the right amount of fun and function for a holiday gift.